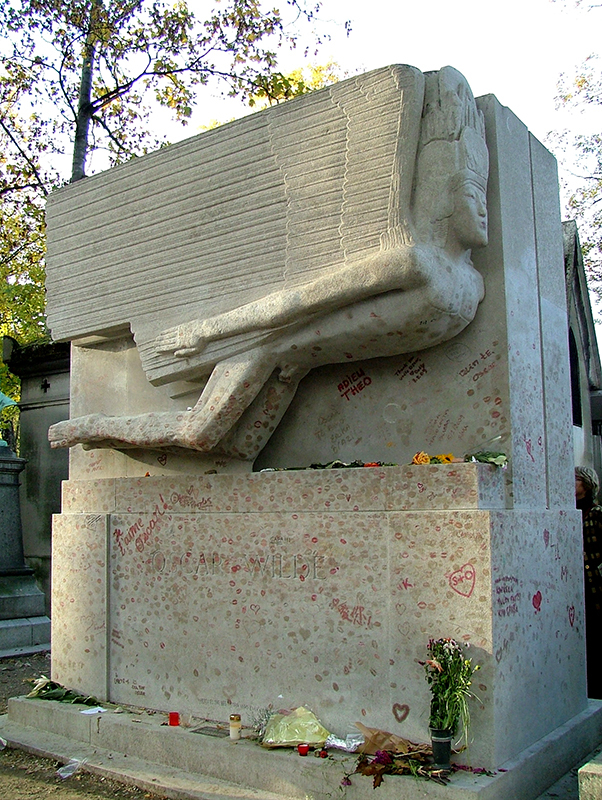 Recently I had a conversation about Oscar Wilde, and I thought I might post some photographs of his grave and Père Lachaise Cemetery for those who have never been there. 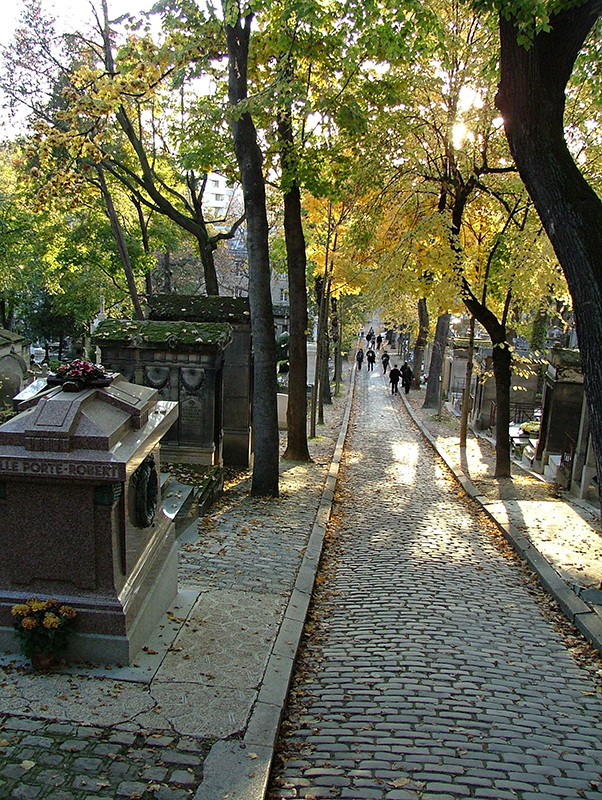 Père Lachaise Cemetery of Paris is a city of its own. The City of the Dead, lined with streets tightly packed with tombs, chapels and mausoleums, housing more than 70.000 bodies, and many more in the Columbarium. Here is a list of the graves you might check to find out that you are familiar with the names, and actually love and admire many of them. I could go on and on talking how amazing this place is. I spent there four hours and still didn’t see all of the graves I wanted to. You can take a guided tour, you can walk the cemetery by yourself with a map in your hands, but please plan this visit. 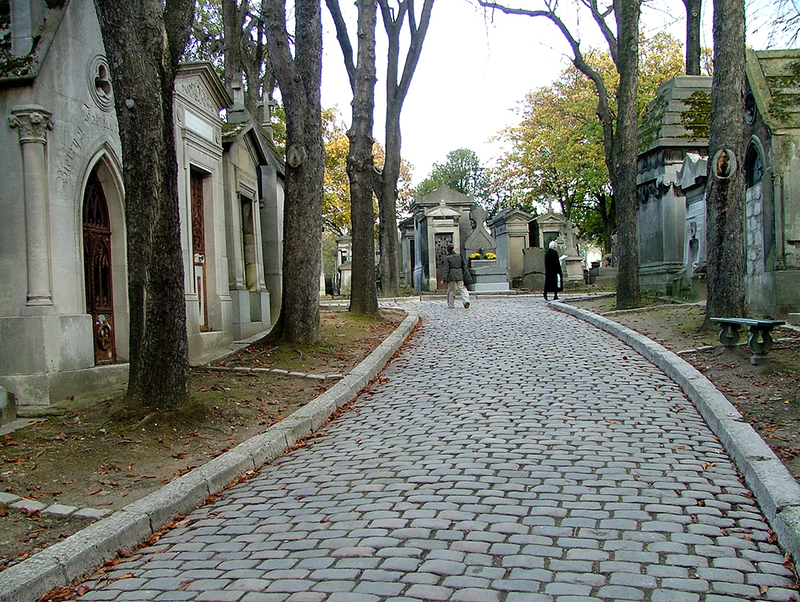 Don’t listen to those who tell you that Père Lachaise is a creepy place. It is not. This visit would be one of the best memories of your life. 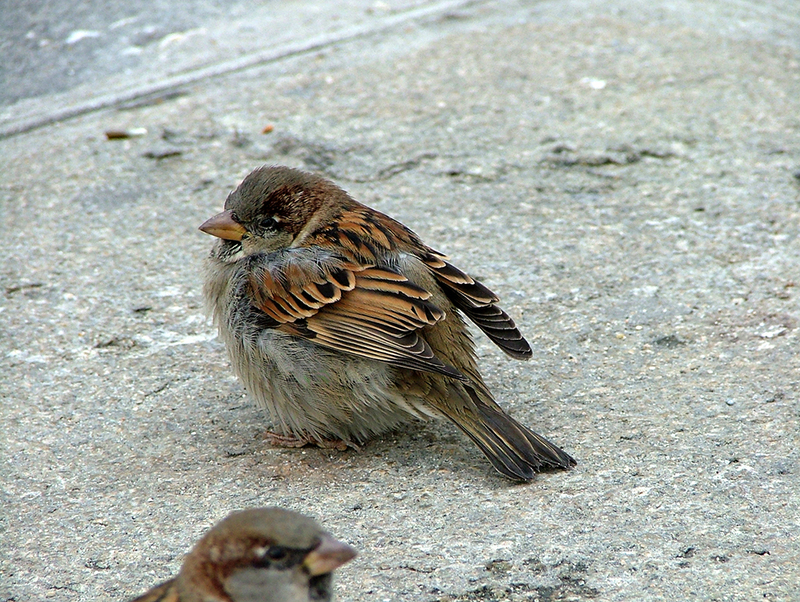 These photographs were taken in 2009. 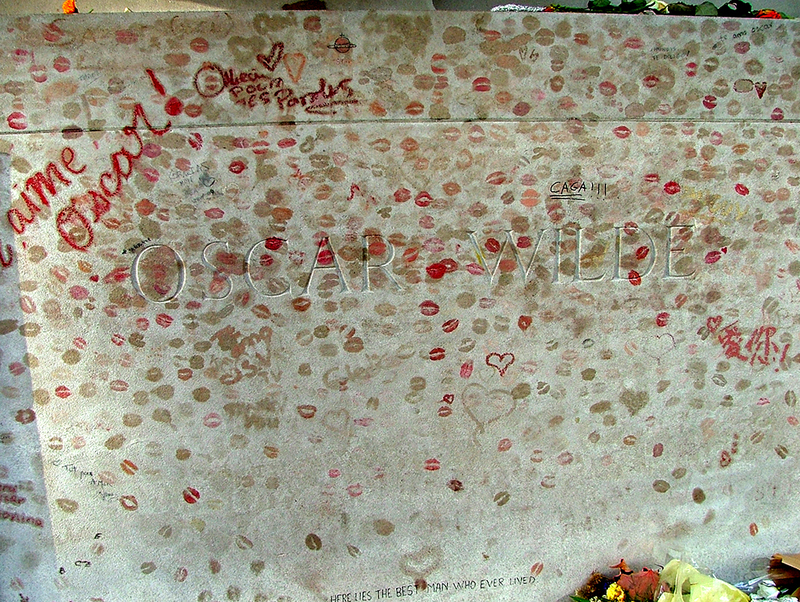 In 2011 a glass panel was installed to protect the hundred-year old monument from damage, which panel was soon covered with new lipstick kisses. The kisses you see on my pictures are all gone after the renovation which, by the way, was financed by Irish Government ( or it is what I have heard). I know these kisses look silly, and I have to confess that I did kiss my fingers and touch the stone. No lipstick though. Just to say thank you to a great man for the lessons I have learned from him since I was twelve, old enough to legally pick up a copy of his Portrait of Dorian Gray from our school library.
. Have a great day! What a lovely post. 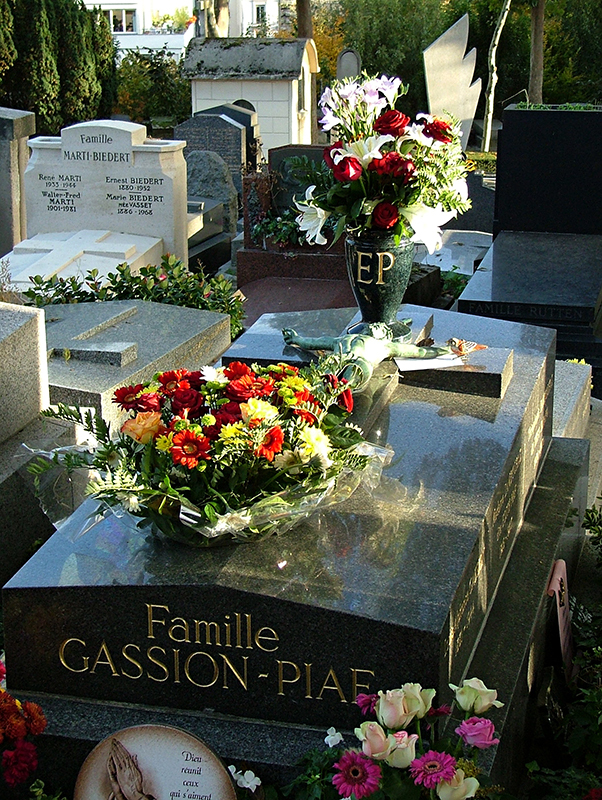 I am very happy that other people visit on the Père Lachaise Cemetery , than us. Last May we visited there for the third time and always it is so interesting with its palpable atmosphere. We always start exploring the cemetery from the grave Jim Morrison. This it took nearly an hour to find it. 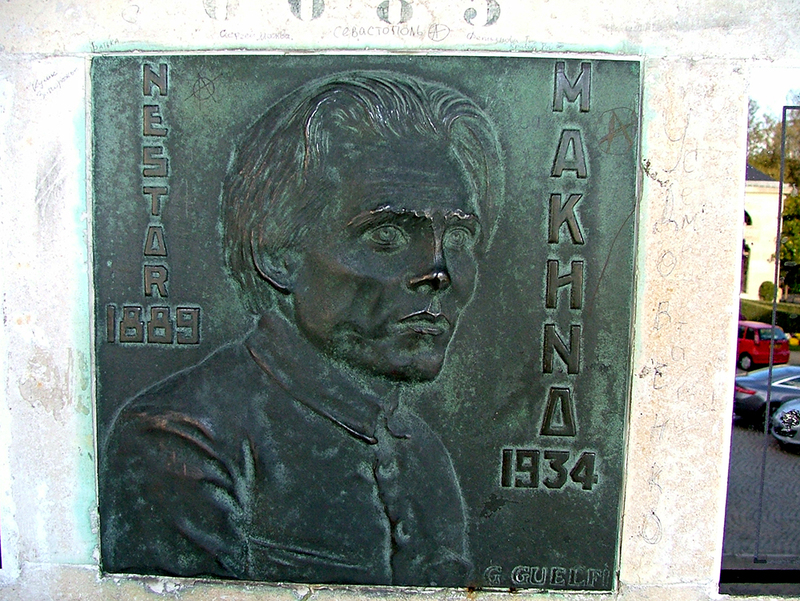 We saw for example Fred Chopin, Vincenzo Bellini, Molière, Sara Bernard, Honorè Balzac, Eugene Delacroix, simone Signoret and Yves Montand, Oscar Wilde, Madame Lampoukas (Edith Piaff). 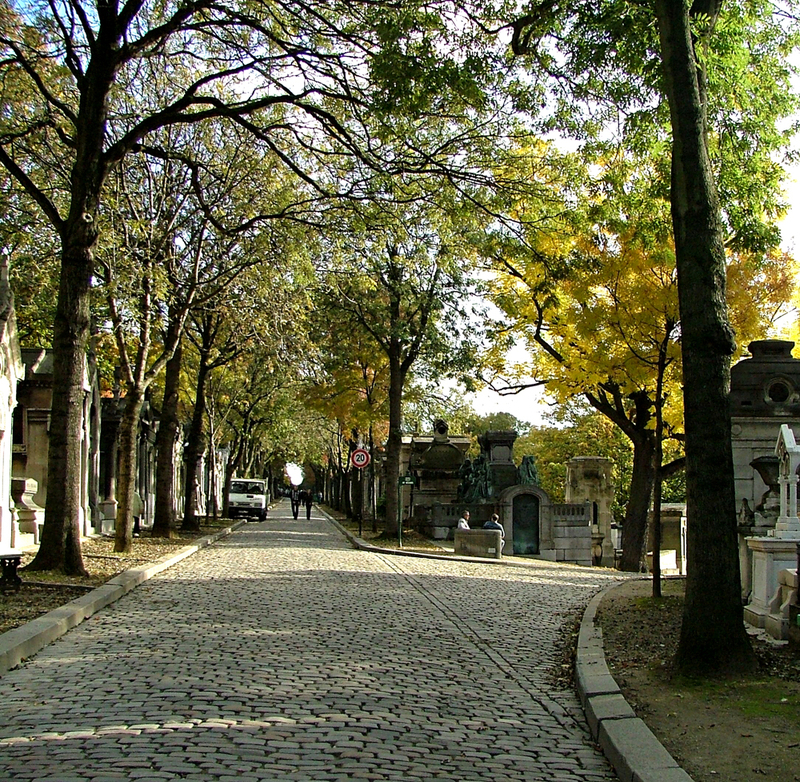 I always say to the people who visit Paris that they have not seen Paris, if they do not visit Père Lachaise Cemetery! Thank you for your comment! I am so delighted that you visited this amazing place. So many familiar names, I feel like I visited my good old friends. 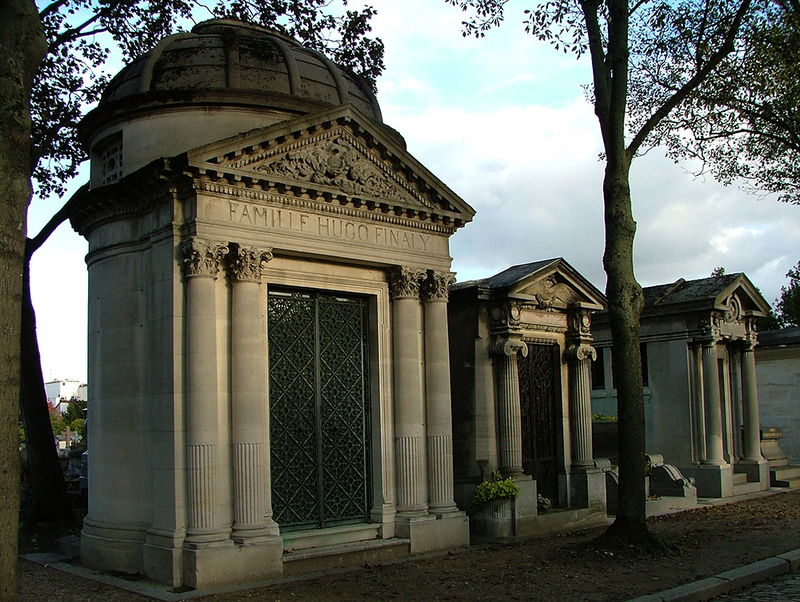 You are so right – trip to Paris is not completed without a visit to Père Lachaise Cemetery. Those lipstick kisses are like the piece of contenporay art! PS I’m also a fan of Oscar Wilde and hadn’t realised this is where he’s buried. Thanks again! I am thrilled to know that I helped you to choose this place. I would advise you to go through that long list of the names, and first of all to mark the names you are familiar with. Second – check out, may be you know somebody else, just forgot their name, and add them to the list too. Don’t miss the Columbarium wall. After that take the map and figure out the route of your excursion, so that you don’t have to walk unnecessary distances – the cemetery is enormous. You can ever read more about the people on your list, to refresh your memory. You will feel like you are visiting your old friends. What a great place! 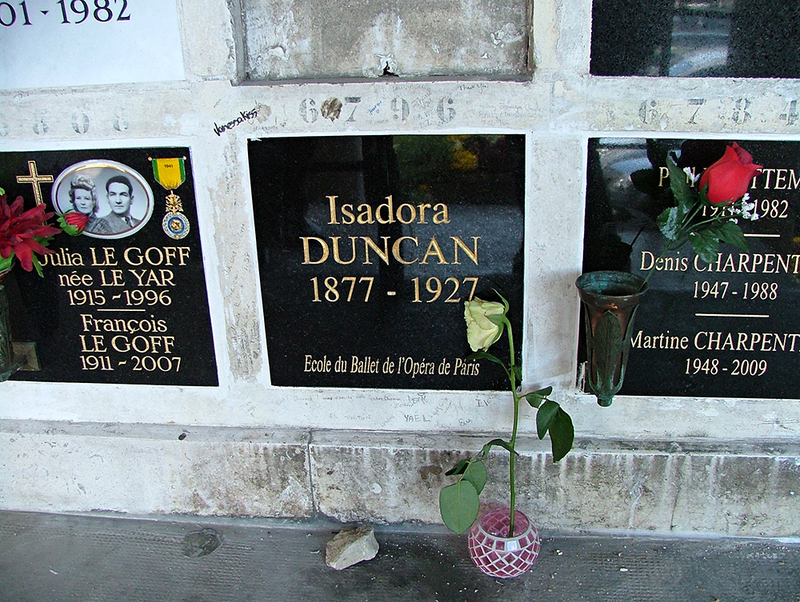 Also the resting spot of Jim Morrison (my kids wanted to see that) and Heloise and Abelard (which I wanted to see). Great photos! 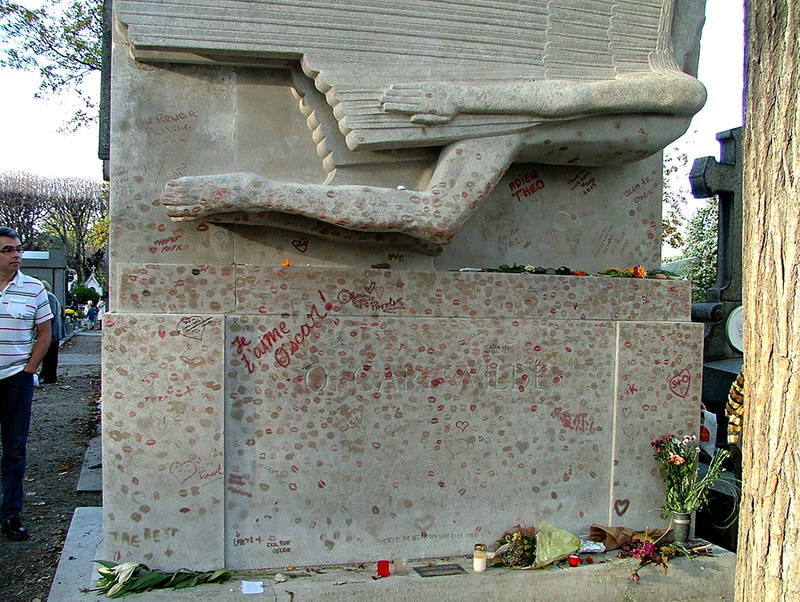 I didn’t get a picture of Jim Morrison grave – because of the crowd. I think I have got Abelard’s. Stunning feeling. I love to visit it although you’ve made me think I haven’t been for a while…I always have to go by Oscar Wilde’s tomb (I love him) but so many interesting people…. Thank you for commenting, Olga! There are so many names we know since we know ourselves. It is like visiting our old friends. What an amazing place…thanks for stopping by my blog! Thank you! Just followed your blog:) Amazing articles and images. Thanks, Inese, I enjoyed your blog as well! I have always found cemetaries fascinating places. It is not macabre but an opportunity to often step back into history especially when there are several family members interred together. 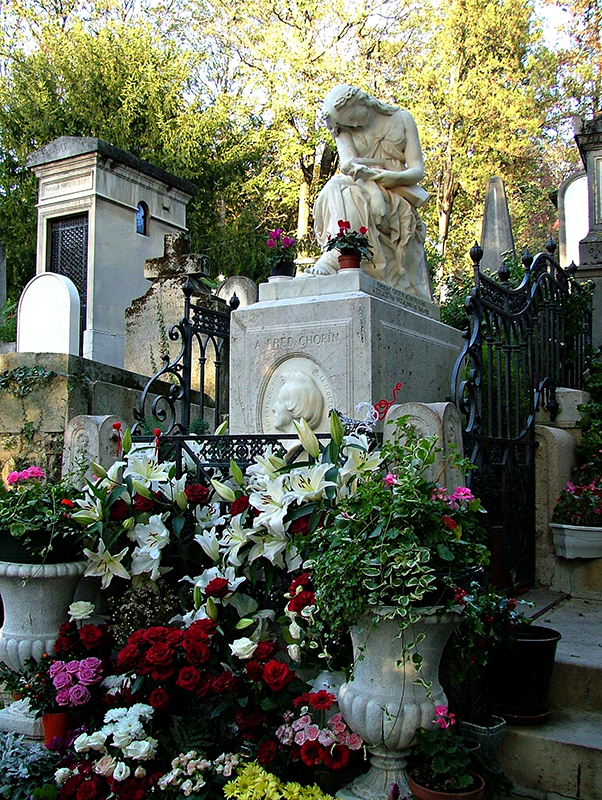 Oscar Wilde would have been delighted to be placed in such a romantic and elegant final resting place and I am sure would have some acerbic but witty comments to make about his neighbours. Lovely tour in a part of Paris that I have not visited but will put on the list. No problem and my pleasure. Great piece. Amazingly beautiful and captivating, dear Inese. Have you written a “what’s in my camera bag” post? I haven’t yet, but they are somewhat popular here in the US. It’s a way of trading photography tips and equipment suggestions. Thank you for today’s tip! I had not thought of that! Is there a meaning behind the “black wolf”? no idea… but i checked the previous nominee blogs and they were good, decent anyway. the lady who nominated me has a great blog too. she was nominated with three awards this time, and has another ten or more on her page. 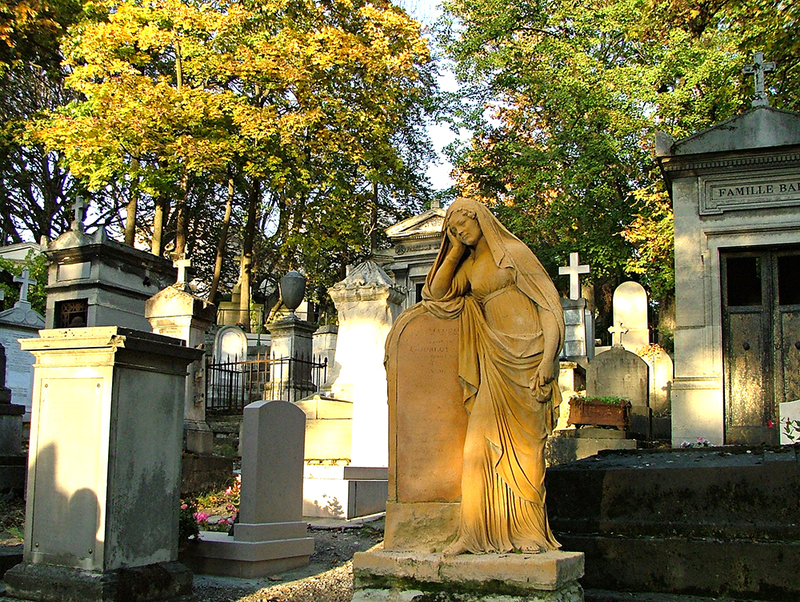 Thanks for sharing this…uh, pretty ritzy cemetery!